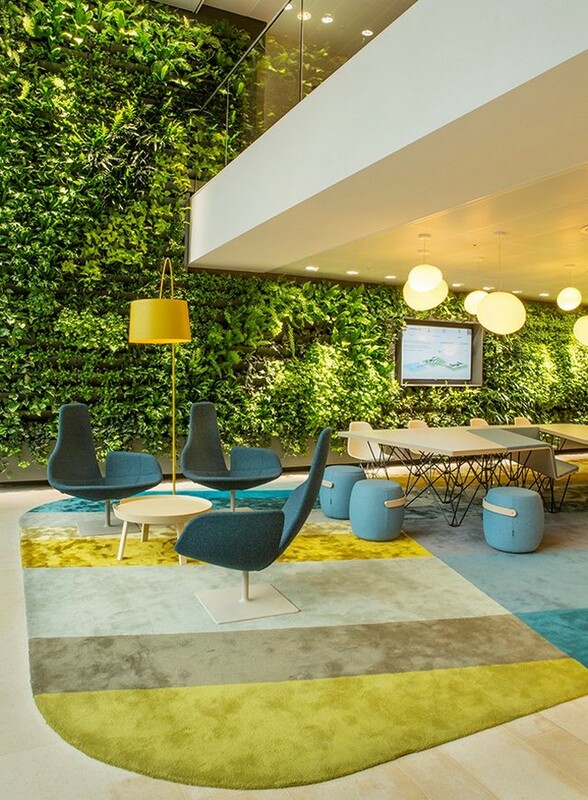 Not only are green walls a beautiful design element, they also provide tremendous benefits. They are being used by cutting edge companies in the world of commercial interior design primarily overseas. What are living green walls anyway? 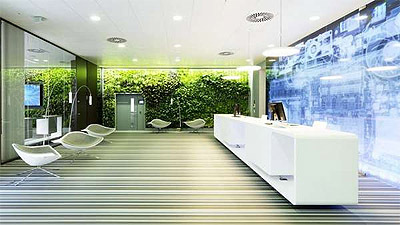 Living green walls are installed on a framework of panels and using hydroponics grow vertically in a space. They are an amazing way to bring the outdoors in. 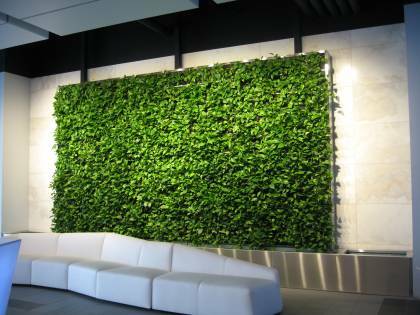 Green walls naturally remove carbon dioxide. 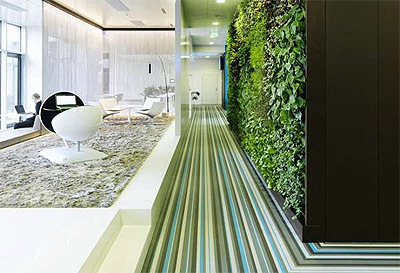 They can also minimize dust, reduce pollutants, detoxify the office environment and possibly assist in minimizing the effects of sick building syndrome. Adding plants is a great way to improve the air quality in your office. Plants can act as an insulator in the winter thereby reducing energy costs. Through the process of evapotranspiration, plants can also cool a building in the summer. Energy savings is a great way to work toward your LEED credits in your office renovation or new commercial interior design. 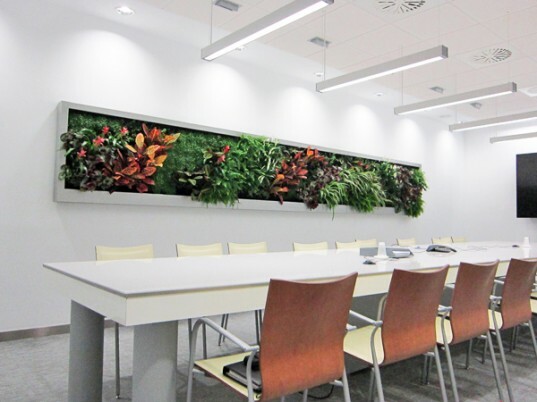 Plants can also reduce high frequency sounds, which makes them ideal for reducing noise in a busy office lobby. I love the juxtaposition of the industrial space with the natural wall and the uber modern furniture. To me this is the most important benefit. We are always striving for the ways we can improve employee productivity and well being or create a positive impression on our clients through the design of our office environments. Numerous studies have been conducted that show that having plants in an office environment increases productivity and improves mood. One of the first pioneers in this research was Robert Ulrich, whose ground breaking work in evidence-based design completely changed the face of hospital and health care design. 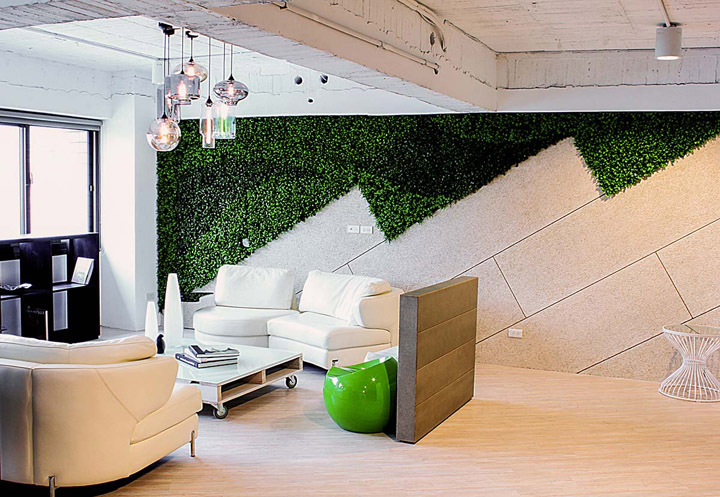 Too much to imagine installing a huge wall of plants? The installation above is on a much smaller scale yet still achieves the look and benefits.